For more than a week now we’ve been saying that the coldest temperatures of the week would occur in Denver and across eastern Colorado on Friday morning. This looks to come to fruition. In anticipation of this cold, the National Weather Service issued a Frost Advisory this afternoon for Friday morning between 4am and 8am. Most locations dropped into the upper 30s early this morning, and we expect tonight will see lows 4 to 6 degrees cooler than that. 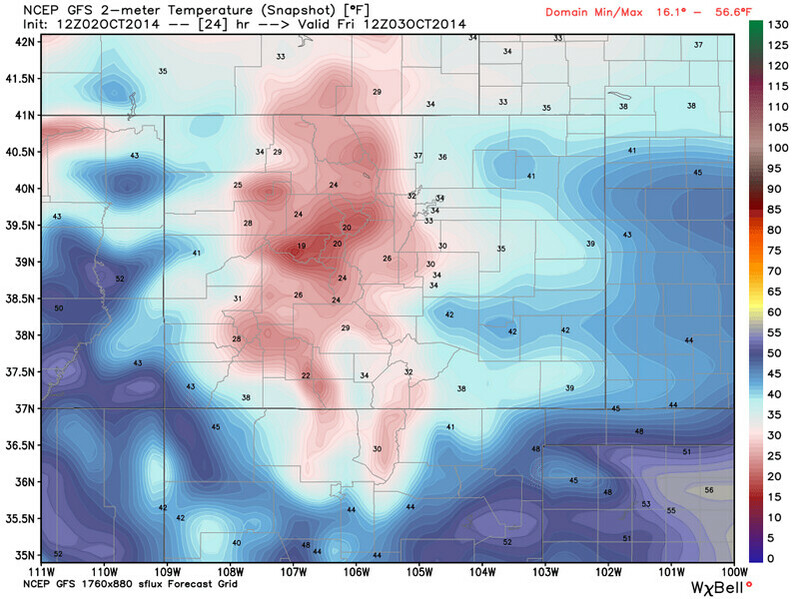 If you’ll recall, last Sunday we mentioned both the GFS and ECMWF had morning lows Friday in the low 40s while the GEM was consistently printing out temperatures near freezing for Denver. As expected, over the last few days we’ve seen some compromise between these solutions, though in general the warmer solutions have trended towards the colder ones. The latest GFS is showing temperatures between 33-35 degrees for Denver Friday morning, with the GEM and ECMWF in the same ballpark. If you’re still hanging on to a few of those less-hardy outdoor plants, we urge you to cover them or bring them indoors for the night. Friday will remain on the chilly side with a cool northwesterly flow aloft. Temperatures may not make it out of the 50s for highs across the Denver area, with overnight lows Friday into Saturday back into the mid to upper 30s. Temperatures will moderate a bit for the weekend but we’ll keep the fall-like pattern going for a few more days. Highs will be back into the pleasant 60s and 70s, with cool temperatures overnight in the 40s.